One possible design of stretchable integrated circuits consists of functional islands of stiff thin films on a polymer substrate. When such a structure is stretched, the substrate carries most of the deformation while the islands experience little strain. However, in practice, the island/substrate interface can never cohere perfectly. Existing experiments suggest that, interface debonding occurs if the island is larger than a certain size. I am now studying the critical size of stiff islands on stretchable polymer substrates due to thin film delamination, using finite element simulations. We show that the maximum energy release rate of interfacial cracking goes down as island size or substrate stiffness decreases. As a result, the critical island size can be enhanced if the substrate is chosen to be more compliant. An approximate formula is given to predict the energy release rate for the configuration of stiff islands on very compliant substrate. Organic LED could replace light bulb? Lighting accounts for about 22% of the electricity consumed in buildings in the United States, and 40% of that amount is eaten up by inefficient incandescent light bulbs. The search for economical light sources has been a hot topic. Recently, scientists have made important progress towards making white organic light-emitting diodes (OLEDs) commercially viable as light source. As reported in a latest Nature article, even at an early stage of development this new source is up to 75% more fficient than today's incandescent sources at similar brightnesses. 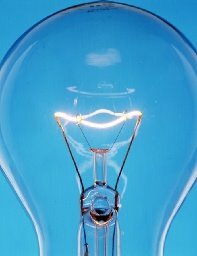 The traditional light bulb's days could be numbered. Read more about Organic LED could replace light bulb? I was notified today that my Web site (http://www.ae.utexas.edu/~ruihuang/) has been included in the E-print Network (EPN). EPN is a fast-growing searchable scientific network of over 20,000 Web sites containing research conducted by researchers - from Nobel Laureates to post-doctoral students - who are offering e-prints of their work via the Internet. Developed by the Office of Scientific and Technical Information (OSTI) to facilitate the needs of the Department of Energy (DOE) research community, E-print Network enhances dissemination of important research and helps to create opportunities for productive professional contacts. E-print Network indexes over 900,000 e-prints. Most documents included in the network are recent scientific literature. Functions available to users include conducting full-text searches, searching for documents by contributing author, establishing a personalized alert service to keep abreast of new e-prints, and exploring laboratory Web sites for further details about selected research programs. Once users find a paper of interest, they can download it from the site hosting the paper. This way you control distribution of your e-prints and can more readily track Web interest in your papers. My page is listed under both Engineering and Materials Science. Starting from January 2006, my group has been posting in Modeling Place as a blogspot to share research experience and ideas. We will gradually migrate to iMechanica for better publicity and more web functions.